Currently, there is worldwide interest in the promotion of mental well-being with measures of well-being adopted as key economic indicators, alongside gross domestic product. Yet, there have been few studies of individually targeted interventions which have the primary aim of promoting mental well-being. In theory, an approach using the principles of cognitive behavioral therapy (CBT) to encourage more healthy patterns of thinking and behavior might offer an individual-level intervention to promote positive mental health. The PsyWell randomized control trial (RCT) has used MoodGYM as part of an intervention trial to understand whether an automated tool to deliver CBT can promote mental well-being at a large scale. Using flashed diagrams and online exercises, MoodGYM teaches the principles of CBT. It also demonstrates the relationship between thoughts and emotions and works through dealing with stress and relationship break-ups, as well as teaching relaxation and meditation techniques. 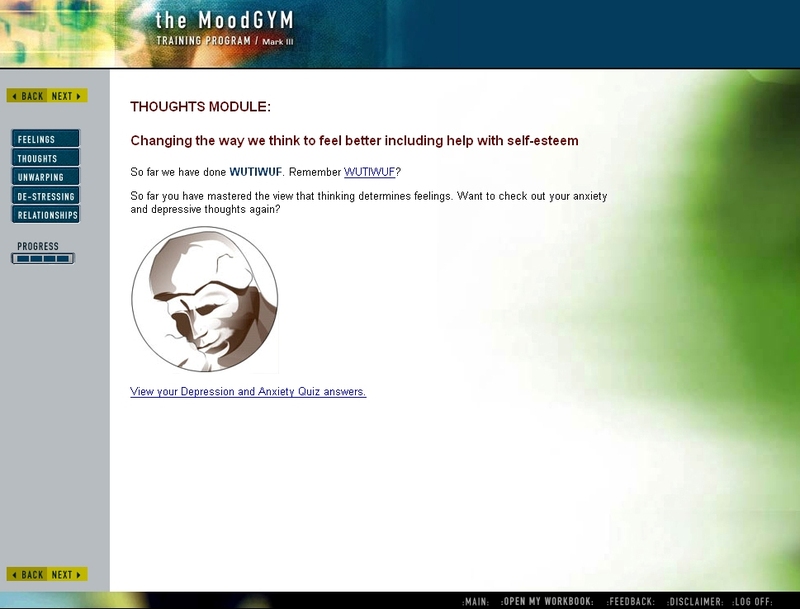 MoodGYM is a free Internet-based self-help program that teaches cognitive behavioral skills. It consists of 5 interactive modules that use diagrams and online exercises. 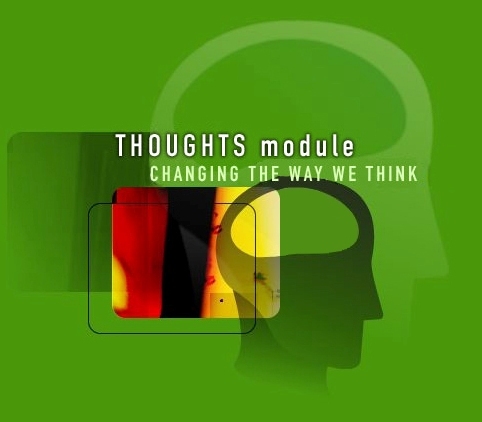 It demonstrates the relationship between thoughts and emotions, examines issues related to stress and to relationships, and teaches relaxation and meditation techniques. It also includes sections on managing relationships and problem solving. Participants are encouraged to work their way through each of the 5 modules, 1 module per week, but are able to work at their own pace. The program includes an online workbook with 29 online exercises to help promote mental health. MoodGYM was designed and developed by staff at the Centre for Mental Health Research at The Australian National University, including researchers, mental health experts, web and graphic designers, and software engineers. Self-directed Internet interventions are known to have low rates of adherence, but this is potentially less of a problem in well-being promotion for the general population than for the treatment of mental illness because it does not raise ethical questions of inadequacy of treatment of a diagnosed health problem. The people who volunteered to take part in the research had relatively low initial mental well-being scores, which is not surprising given volunteers were requested from the general population to take part in research to improve their mental well-being. Analyses still showed that the treatment effect remained highly significant between the two arms of the trial indicating that well-being was improved alongside depression. MoodGYM was designed and developed by staff at The Australian National University in Australia, particularly to prevent depression in young people in Australia. However since inception in 2004, MoodGYM has attracted users from around the world. MoodGYM now has over half a million registered users. Generalisability may be influenced by creating ‘culturally appropriate’ versions of the intervention and in other languages, given that it is largely text-based. The freely available version was written for an Australian audience and was largely well received by English users. In addition to the English version, the program has been translated into Norwegian, Chinese, Dutch, and Finnish. MoodGYM will remain a free program, available for all to use. PsyWell was a randomized control trial (RCT) with a waiting-list control. The RCT used advertisements on a national health portal and through its mailing list, recruited 3,070 participants. The intervention arm received weekly email reminders to access MoodGYM. The control group received access to the intervention after the trial was completed and received no specific intervention or email reminders. Outcomes were assessed by using self-completion questionnaires. A cost effectiveness analysis has not been performed. The program is a public good and being delivered online, therefore the marginal cost for each participant is likely to be very low. In a public health intervention designed to shift the whole distribution of mental well-being upwards in a population, such a difference can be important because a small difference per individual can bring a major benefit in population terms. 1. Christensen H et al. (2004) Delivering interventions for depression by using the internet: randomised controlled trial. British Medical Journal, 328(7434):265. 2. Christensen H et al. (2006) Online randomized controlled trial of brief and full cognitive behaviour therapy for depression. Psychological Medicine, 36(12):1737-1746. 3. Mackinnon A et al. (2008) Comparative randomised trial of online cognitive-behavioural therapy and an information website for depression: 12-month outcomes. British Journal of Psychiatry 192(2):130-134. 4. Christensen H et al. (2004) A comparison of changes in anxiety and depression symptoms of spontaneous users and trial participants of a cognitive behavior therapy website. Journal of Medical Internet Research, 6(4):e46. 5. Powell J et al. Effectiveness of a Web-Based Cognitive-Behavioral Tool to Improve Mental Well-Being in the General Population: Randomized Controlled Trial. J Med Internet Res 2013;15(1):e2. 6. ISRCTN (2010) The PsyWell study: promoting Psychological Wellbeing using an internet-based training programme. [Accessed: 28 November 2013]. 7. Todkill D et al. (2013) Participant experiences of an internet-based intervention and randomised control trial: interview study. BMC Public Health, 13:1017. 8. Calear AL et al. (2009) The YouthMood Project: A cluster randomized controlled trial of an online cognitive behavioural program with adolescents. Journal of Consulting and Clinical Psychology, 77(6): 1021-1032. 9. Neil AL et al. (2009) Efficacy and effectiveness of school-based prevention and early intervention programs for anxiety. Clinical Psychology Review, 29:208-215. 10. O’Kearney R et al. (2009) A controlled trial of a school-based Internet program for reducing depressive symptoms in adolescent girls. Depression and Anxiety, 26(1): 65-72. 11. Farrer L et al. (2011) Internet-Based CBT for Depression with and without Telephone Tracking in a National Helpline: Randomised Controlled Trial. PLoS One, 6(11): e28099. 12. Farrer L et al. (2012) Web-based cognitive behavior therapy for depression with and without telephone tracking in a national helpline: Secondary outcomes from a randomized controlled trial. Journal of Medical Internet Research, 14(3): 64-73.